Darjeeling District (Bengali: দার্জিলিং জেলা; Nepali: दार्जीलिङ जिल्ला) is the northernmost district of the state of West Bengal in eastern India in the foothills of the Himalayas. The district is famous for its beautiful hill stations (and is often referred to as the Queen of the Hills) and Darjeeling tea. Darjeeling is the district headquarters. Kalimpong, Kurseong and Siliguri, three other major towns in the district, are the subdivisional headquarters of the district. Mirik, another town of the district, has been developed as a lake resort since the late 1970s. Geographically, the district can be divided into two broad divisions, the hills and the plains. The entire hilly region of the district comes under the Darjeeling Gorkha Hill Council, a semi-autonomous administrative body under the state government of West Bengal. 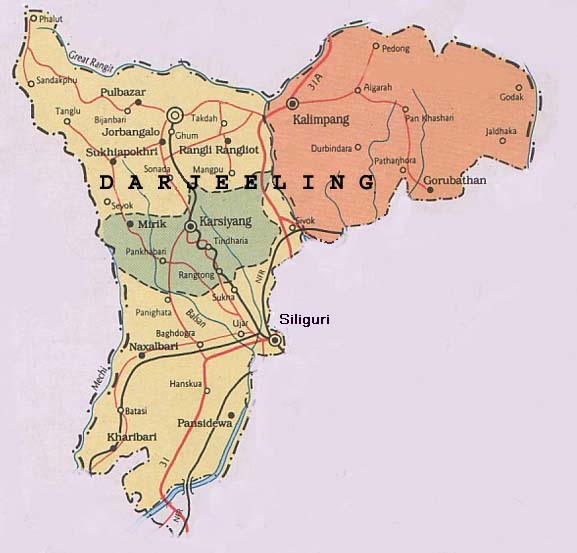 The council covers the three hill subdivisions of Darjeeling, Kurseong and Kalimpong. The foothills of Darjeeling Himalayas, which comes under the Siliguri subdivision, is known as the Terai. The Terai is bounded on the north by the mountains, on the south by Kishanganj district of Bihar state, on the east by Jalpaiguri district and on the west by Nepal. It has a length from north to south of 18 miles (29 km), and a breadth from east to west of 16 miles (26 km). As of 2011 it is the second least populous district of West Bengal (out of 19), after Dakshin Dinajpur. The district comprises four subdivisions: Darjeeling Sadar, Kalimpong, Kurseong and Siliguri. Darjeeling is the district headquarter. There are 17 police stations, 12 community development blocks, 4 municipalities, 1 municipal corporation and 134 gram panchayats in this district. Darjeeling and Kalimpong contain one municipality each and Kurseong has two. Siliguri has a municipal corporation instead. The community development blocks are divided into rural areas with gram panchayats. and census towns. In total there are 9 urban units: 4 municipalities, 1 municipal corporation and 4 census towns. Also, Darjeeling city and Pattabong Tea Garden are part of a urban agglomeration. Darjeeling Pulbazar (Community development block) consists of rural areas with 23 Gram Panchayats and one census town: Pattabong Tea Garden. Rangli Rangliot (Community development block) consists of rural areas only with 11 Gram Panchayats. Jorebunglow Sukhiapokhri (Community development block) consists of rural areas only with 16 Gram Panchayats. Kalimpong I (Community development block) consists of rural areas only with 18 gram panchayats. Kalimpong II (Community development block) consists of rural areas only with 13 Gram Panchayats. Gorubathan (Community development block) consists of rural areas only with 11 gram panchayats. 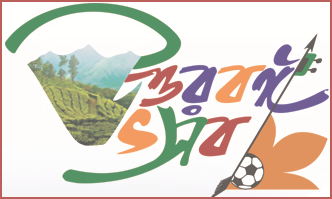 Mirik (Community development block) consists of rural areas only with 6 Gram Panchayats. Kurseong (Community development block) consists of rural areas with 14 Gram Panchayats and one census town: Cart Road. Matigara (Community development block) consists of rural areas with 5 Gram Panchayats and one census town: Bairatisal. Naxalbari (Community development block) consists of rural areas with 6 Gram Panchayats and one census town: Uttar Bagdogra. Phansidewa (Community development block) consists of rural areas only with 7 gram Panchayats. Kharibari (Community development block) consists of rural areas only with 4 gram Panchayats.